When I was just a little girl my mom would tell me to eat my carrots and they would make my eyes see in the dark like the cats. I guess that wasn’t just an old wive’s tale or a trick to get me to eat my carrots as research now shows that the beta-carotene in carrots goes through a process in our bodies which results in good night vision. If she had served rainbow carrots I am sure she would not have had any problem with me eating them. Especially if she made Ginger Glazed Rainbow Carrots. Improved vision is not the only benefit that we get from eating carrots. 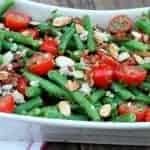 Besides the fact that they are sweet and crunchy they are full of nutrients, low in calories, no fat and just plain delicious either cooked or raw. 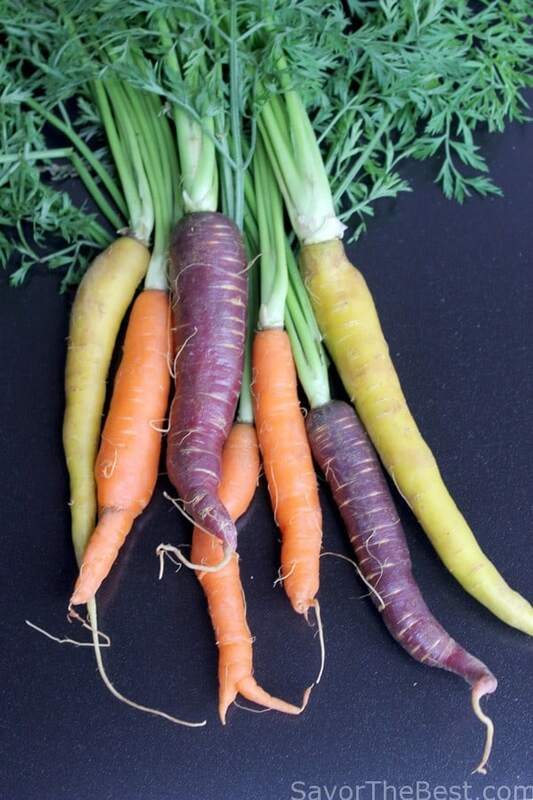 Carrots grow in all sorts of shapes and sizes and although we usually think of carrots as orange in color there are different colors and I especially like these rainbow carrots. Carrots have a lot of carotenoids, which is the colorful plant pigments that the body uses to turn into vitamin A. Carotenoids are powerful antioxidants that can help prevent some forms of cancer and heart disease, and act to enhance your immune response to infections. 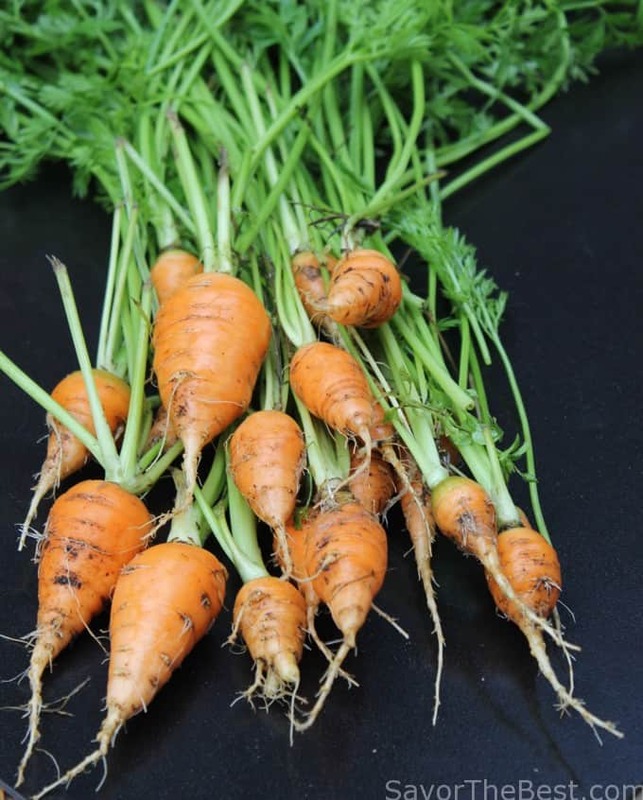 I have also learned a little more “carrot trivia” that when you cook carrots in fat or oils, puree or juice them it increases the availability of the carotenoids by 600 percent. Fats help the absorption of carotenoids into the blood by 1000 percent as the carotenoids are fat soluble. In the spring of 2013, Don and I planted a row of carrots in our garden and since the seeds were about the size of a dust particle we said, “never again”. If you have ever planted carrot seeds you know what I mean about the seeds being small and difficult to plant. We didn’t have much of a harvest either as they were so difficult to thin out that we ended up with just a few carrots. This year when it was ‘garden season’ I ordered a package of carrot seed tape from Territorial Seed Company in Oregon and I thought they would be the perfect fix to our carrot seed planting issue. It was definitely much easier, just unroll the tape on the ground, cover it with soil, water it and, viola….carrots in a couple of months. Well, it didn’t work out very well and I would pull one up now and then through-out the summer but they were just too tiny and didn’t want to grow. Finally, last week I pulled up all of our pitiful-looking harvest. They were small, gnarly and basically handicapped looking carrots. 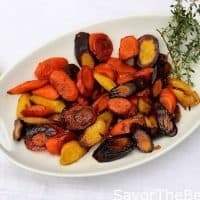 This recipe for Ginger Glazed Rainbow Carrots was inspired as I watched a Food Network program by Amy Thielen, and I adapted it by adding my little twists and tweaks of a squeeze of lemon juice and some ginger preserves for a unique flavor. These preserves are thought to have originated in Dundee, Scotland and are imported to America. I buy mine locally at Central Market for under $6, I think that is a little pricey but I hoard mine for special. 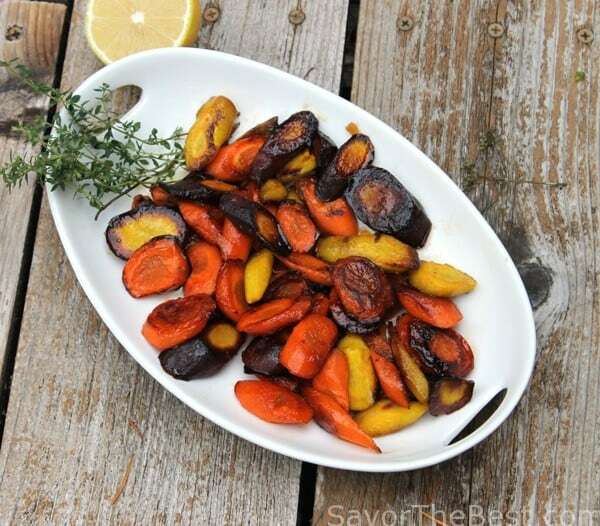 This recipe for Ginger Glazed Rainbow Carrots makes a colorful side dish that is low-fat, low-calorie, healthy and delicious. What else do we need? 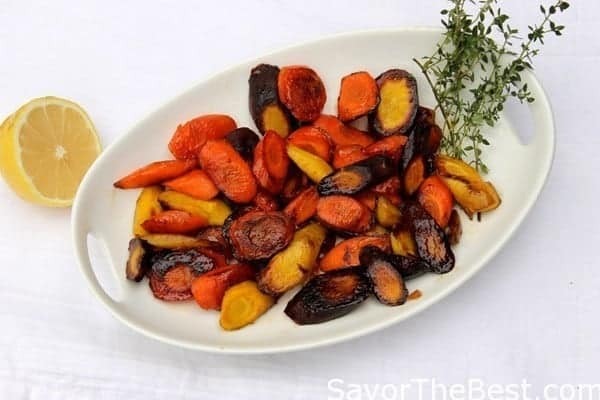 This recipe for Ginger Glazed Rainbow Carrots makes a colorful side dish that is low-fat, low-calorie, healthy and delicious. Peel the carrots and slice them diagonally, about 1/2-inch thick and as close to the same size so they will cook evenly. You should have about 2 cups of sliced carrots. Add the coconut oil to a cast-iron skillet over medium heat and using a silicon or pastry brush coat the bottom of the skillet with the oil. Add the sliced carrots to the skillet and spread them out so they do not overlap. 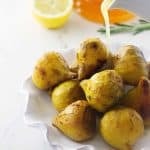 Sprinkle with the salt and pepper and sauté them for 3 or 4 minutes, allowing them to brown lightly and caramelize, watch them closely so they do not burn. When they are to the desired color, flip each slice with a fork and allow the other side to brown, this will take another 3 or 4 minutes. 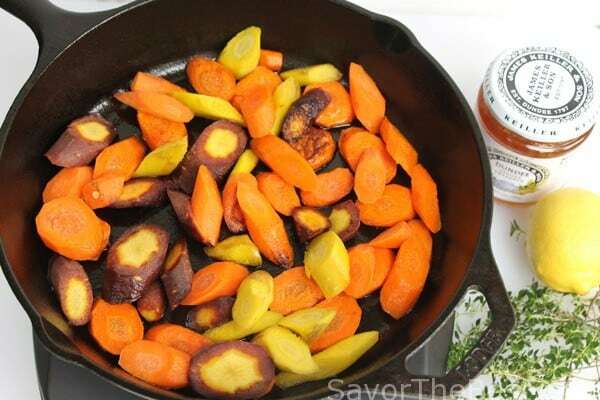 Remove the carrots from the skillet and transfer them to a serving bowl. 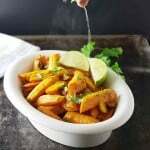 Gently toss the carrots with the ginger preserves, squeeze the lemon juice over the top and add the thyme garnish. Serve and enjoy! I’ve never had much luck growing carrots, either. Thought about that tape deal, but never did it. Doesn’t sound as if it’s worth it. What’s worth it, though, are these great glazed carrots. Fantastic dish! Thanks. I love the different color carrot’s you used to make it interesting and I think the added ginger is brilliant! Actually your rough and rugged home grown carrots don’t look so bad to me! Of course I can’t grow a thing so I’m impressed easily…but still I’d eat ’em!